What makes today’s negative interest rate environment so worrying is this; to the extent that demand is growing at all in the world economy, it seems again to be almost entirely dependent on rising levels of debt. The financial crisis was meant to have exploded the credit bubble once and for all, but there’s very little sign of it. 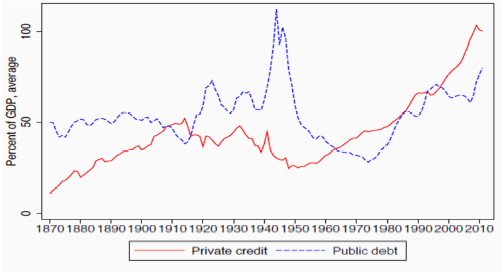 Rising public indebtedness has taken over where households and companies left off. And in terms of wider credit expansion, emerging markets have simply replaced Western ones. The wake-up call of the financial crisis has gone largely unheeded. One by one, all the major central banks have joined the money printing party. First it was the US Federal Reserve. Then came the Bank of England and later the Bank of Japan. Just lately, it’s the European Central Bank. Now even the People’s Bank of China is considering the “unconventional” monetary support of bond buying. Anything to keep the show on the road. It’s what Chris Watling of the consultancy Longview Economics has termed the “philosophy of demand at any cost”. A crisis caused by too much debt has been fought with even more of the stuff. Both Keynsian and monetary economics seem to be in some kind of end game. What comes next is anyone’s guess. The longer it goes on the worse the correction – the banks should be allowed to fail. What is interesting is that central banks are buying gold as fast as they can and many are holding that gold at home rather than in the US or England. Maybe there are nervous people about? That the change to the fiat money system in 1971 was also the same time society began it’s Progressive Long March is no coincidence. Getting rid of a relatively fixed money supply tied told to gold meant that the scope for government borrowing became unlimited. This brave new monetary world replaced saved capital with credit, and investment with consumption. The Long March through the institutions yielded an entire generation unable to defer gratification and take personal responsibility, nowhere more devastatingly evidenced in the collapse of the nuclear family and all its attendant problems. This is how democracies die and is why we are seeing the emergence of Police States across the West as Governments try to maintain their grip on a dying system. You’re right about generational decline. Kiwiblog has basically degenerated into an outlet for divisive Marxist cant and more and more commenters there are just worthless left wing graduates from a politically corrupt education system. Its gradually losing all of its worth as an outlet for differing views. With Key at the helm, and Clark for 8-9 years before that we have a whole generation who have grown to adulthood without being exposed to any thing other than Keynesian socialist crap, pseudo-environmentalism and racism. You can actually reach more people and I think have more impact on twitter if you can grow your follower numbers. I have just passed the 1000 mark, and if someone retweets what you post, and they have 50,000 followers, and then some of their followers retweet again, you can reach hundred of thousands and possibly millions with one tweet. Its far more productive use of time than jousting with scum status quo cowards like SH or complete morons like idiotboy or drooling MSM disciples like Grief on Kiwiblog. Idiotboy & Grief are morons, of that there is no doubt. SH on the other hand, in addition to being a moron, is a real piece of work. A big, blustering, cowardly, nasty, lying fake Cherokee who is as thick as two short planks. I enjoy people taking a differing point of view but never in my life have I come across an animal like him. Why DPF, permits him to post I’ll never know. Massive “fiscal” crises as governments work out that they can’t borrow any more. and then – if we’re lucky – cops & the army step in, deal with the rioters and agitators, and ensure someone trustworthy takes over to run the government. if we’re lucky.